Check out Tobi's Sweetheart Ruffle Skater Dress You're the cherry on top. The Black Multi Sweetheart Ruffle Skater Dress is modest and sweet for a new season spin on cherry print dresses. This long sleeve dress has a ruffled v neckline, and trendy sleeve ties. Pair this skater dress with booties for work and play to bring cherry dresses into winter. You're the cherry on top. The Black Multi Sweetheart Ruffle Skater Dress is modest and sweet for a new season spin on cherry print dresses. This long sleeve dress has a ruffled v neckline, and trendy sleeve ties. 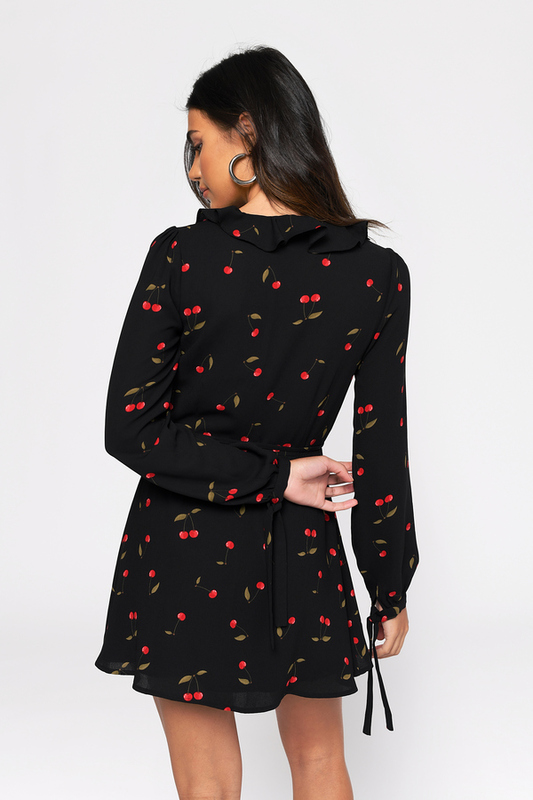 Pair this skater dress with booties for work and play to bring cherry dresses into winter.